This evaluation discusses in marketing terms how essential oil blend retailers and manufacturers target their nutritional oil blend formulas. 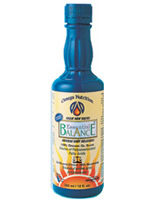 Udo's Choice Oil Blend and Omega Nutrition's Essential Balance Formula. There are two forms of fats that are vital for our continued existence. These fats are called Omega 3 and Omega 6 essential fatty acids (EFA's). They are essential because every living cell in the human body needs them for proper development and optimal health. The body cannot make them on its own, so a direct food source and proper supplementation is crucial, hence the name ‘essential’ fatty acids. Supplementing with an essential fatty acid oil blend is the most effective form of obtaining the corect amounts of EFA's needed in the diet to be healthy. Udo's Choice Oil Blend is a unique essential fatty acid oil supplement that provides a reliable source of Omega 3 and Omega 6 essential fatty acids. It also includes Omega 9 essential fatty acids. Udo's Choice Oil Blend is for adults who fall into one of the three following categories: healthy people (people who are near normal weight and who have no major health problems), sick people (people who suffer from chronic degenerative diseases) and active people (professional athletes, construction laborers and fitness buffs who burn more calories in physical activity than the average person). Udo Erasmus is an international nutrition celebrity who is notorious for introducing people to the importance of dietary fat. His image appears on the label of the package of Udo’s Choice Oil Blend, clearly distinguishing it from competing brands on the market. Flora Health manufactures Udo’s Choice Oil Blend. The oil is pressed and filtered in a state-of-the-art, low heat, light and oxygen-free environment to maximize stability and provide nutritional value and freshness. Nitrogen purged, amber glass bottles are filled with the oil blend and then nitrogen flushed to eliminate oxygen. The bottles are then capped and packed in a box to further protect the ingredients and ensure the highest possible quality. Udo Erasmus travels around the globe promoting Udo’s Choice Oil Blend. He presents lectures and seminars, which attract a great deal of media attention worldwide. Flyers, floor displays, samples, demonstrations, monthly and periodic specials, catalogues and advertisements in health and wellness magazines are all methods used to further promote Udo’s Oil Blend. Consumers can submit their recipe or personal case history to the udoerasmus.com web site to win a complete line of Udo’s Choice products. 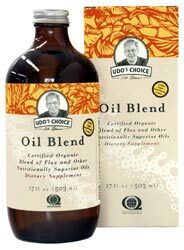 Udo’s Oil Blend is not sold directly to consumers, nor is it available from his web site. It is available through retailers at participating quality natural health food stores and pharmacies across Canada. It is also indirectly distributed to consumers across the globe. Once Udo’s Oil is processed, it is distributed to health food stores via courier so that it arrives within a two-day time frame. Distributors are instructed to either refrigerate or pack the oil with freezer gel packs to keep it minimally cool. Retailers are asked to place the bottles of oil into a refrigeration unit as soon as possible. They are also advised to inform consumers to refrigerate the oil at the point of purchase. Essential Balance Oil Blend was created by Omega Nutrition to address the newly discovered critical deficiency of the Omega 3 essential fatty acid in the modern day diet. Scientific research has linked essential fatty acid deficiencies to people with chronic diseases that include: arthritis, psoriasis, heart disease and certain cancers. Essential Balance Oil Blend is packaged in labeled plastic containers, which have a non-transparent finish that are designed to protect and maintain the oil within. The Omegaflo manufacturing process is used with exclusive legal rights for producing Essential Balance Oil Blend. This process guarantees: a unique, cold-pressed extraction method, fresh and organic unrefined oil, premium taste, oil that is 100% trans-fatty acid free and oil that is of the highest nutritional quality. Essential Balance is marketed to consumers using the slogan, The Convenient Way to Return to Balance to Your Life. This slogan is based on the premise that for many years the human diet evolved on a natural selection of foods, which provided an equal 1:1 ratio of Omega 3 to Omega 6 essential fatty acids. Modern agriculture, harmful refined oils, and hydrogenation have since destroyed this healthy balance. Essential Balance Oil Blend offers a quick return to this ideal balance. Flyers, floor displays, samples, demonstrations, monthly and periodic specials, catalogues and private labels for retailers are all methods used to promote Omega Nutrition’s Essential Balance Oil Blend. Consumers can enter to win $200 in free products at omeganutrition.com for filling out a customer web site survey. Omega Nutrition sells their Essential Balance Oil Blend formula directly to consumers from their web site. It is also sold to retailers through wholesalers, distributors, brokers and independent sales representatives. Considering the fact that both essential fatty acid oil blends have relatively similar profiles, both also offer similar benefits. However, one very important product characteristic distinguishes Udo’s Oil Choice Blend from Omega Nutrition’s Essential Balance. As stated, Udo’s Choice Oil Blend is packaged in amber glass. Glass is immobile, natural and does not leak into the oil. Glass has a track record safe for food use. Plastic containers on the other hand are not safe for the packaging of oils. Research proves that many plastics are dangerous to a person’s health. Plastic is an artificial man-made material. The unnatural molecules contained in the plastic can interfere with the life chemistry of the oil, thereby adding to health problems. Omega Nutrition uses plastic instead of glass to try and gain an edge over the competing market because it is cheaper, durable and less expensive to ship. The decision to use glass over plastic is always health and environment related. The fact that Flora Health will go to the extra trouble to use glass is the most obvious way to confirm that this manufacturing company has its heart and soul dedicated to people’s health and to the environment. For this reason, Udo’s Choice Oil Blend is the better product and has the potential to benefit nearly everyone who supplements with it. The Carbohydrate Scam - List of Foods to Avoid! -Udo Erasmus "Let me make one more point about carbohydrates. They are fuels that the body burns for energy. They are good fuels if you burn them. They are bad for you if you don’t!"